The fast: mere hunger and thirst, or a means of growing spiritually and getting closer to Allah. How can we transform ourselves from being the former into the latter? 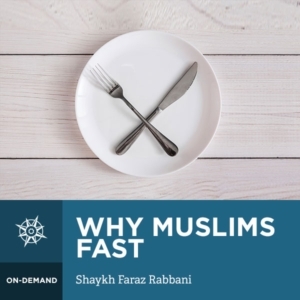 In this course, Shaykh Faraz Rabbani explains the great potential latent within one’s fasting, and give clear, and practical advice to changing one’s fast from being passive hunger and thirst into an active spiritual refinement of one’s soul. Students will learn how to benefit from fasting in general, and more specifically from the month of Ramadan. Al-Rayyan – He whose thirst is completely quenched – is the name of the door of Paradise which awaits those to blessed with the ability to fast. Allah Himself has declared that fasting is specifically His, and that it has a special reward from Him. In order to make the most of this great act of worship, one must know its worth, how to make the most of it, and what to avoid during it. All of these matters are clearly presented in this course by Shaykh Faraz Rabbani. Based on the work Maqasid al-Sawm, (The Aims of Fasting), by the great polymath al-ʿIzz ibn ʿAbd al-Salam, this course will imbue within you the greatness of fasting as a means of drawing closer to Allah, motivate you to maximise fasting and the month of Ramadan, and guide you to the best means of continuing this trend beyond the blessed month. Shaykh Faraz Rabbani spent ten years studying with some of the leading scholars of recent times, first in Damascus, and then in Amman, Jordan. His teachers include the foremost theologian of recent times in Damascus, the late Shaykh Adib al-Kallas (may Allah have mercy on him), as well as his student Shaykh Hassan al-Hindi, one of the leading Hanafi fuqaha of the present age. He returned to Canada in 2007, where he founded SeekersHub in order to meet the urgent need to spread Islamic knowledge–both online and on the ground–in a reliable, relevant, inspiring, and accessible manner. He is the author of: Absolute Essentials of Islam: Faith, Prayer, and the Path of Salvation According to the Hanafi School (White Thread Press, 2004.) Since 2011, Shaykh Faraz has been named one of the 500 most influential Muslims by the Royal Islamic Strategic Studies Center.